Today, the unemployment rate is kissing 10 percent. Global financial markets are sending us a message that the excess demand for high-quality financial assets is growing again. But whenever I wander the halls of Washington these days, I can’t help but think that something else is going on — that a deep and wide gulf has grown between the economic hardships of Americans and the seeming incomprehension, or indifference, of courtiers in the imperial city. Have decades of widening wealth inequality created a chattering class of reporters, pundits and lobbyists who’ve lost their connection to mainstream America? Has the collapse of the union movement removed not only labor’s political muscle but its beating heart from the consciousness of the powerful? Has this recession, which has reduced hiring more than it has increased layoffs, left the kind of people who converse with the powerful in Washington secure in their jobs and thus communicating calm while the unemployed are engulfed in panic? Are we passively watching an unrepresented underclass of the long-term unemployed created before our eyes? The idea of a permanent underclass of long-term unemployed completely disconnected from the job market has been increasing year in and year out, and in this crisis it may take on a serious hold for sizable chunk of the American population. (Click through for larger image.) As you can see, this crisis has been more devastating for the less educated in society. But how does it look comparably? 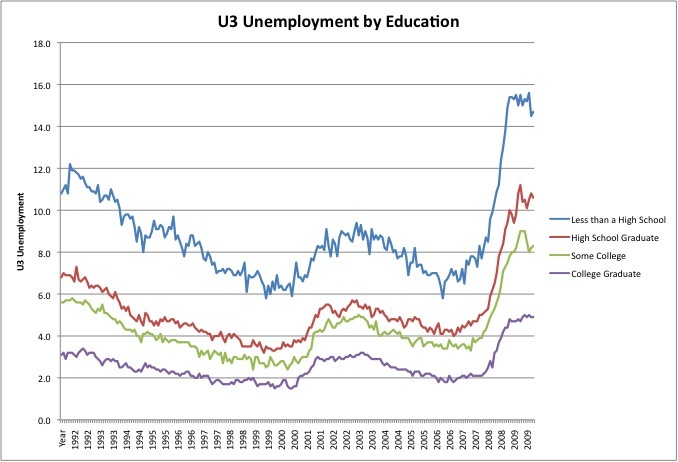 I take the same data, and subtract the U3 unemployment rate for college graduates and above for each of the top three education lines. 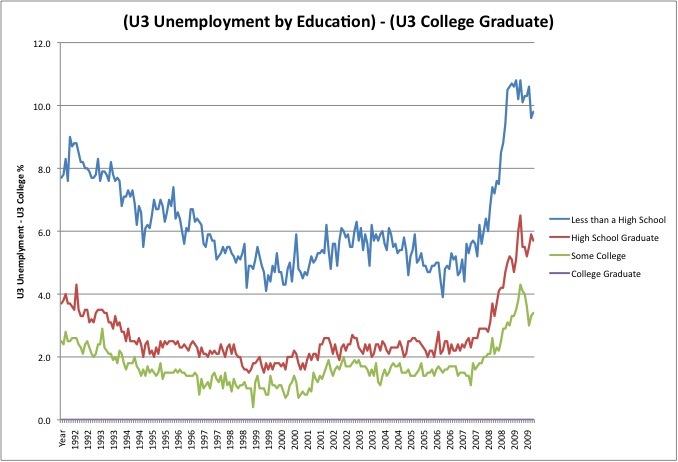 What’s interesting is that the unemployment rate above college graduate is consistent, or declining out of the 1992 recession, from 1992 to 2006. High school graduates had 3 percent higher unemployment rate over college graduates during the boom of 95-99, the crash of 00-03, and the weak jobless recovery of the "Greatest Story Never Told" economy of 04-07. In good times as in bad, this was consistent, and not since the 1992 recession has there been a disconnect. But during this crisis, it has skyrocketed; high school graduates now have 6 percent higher unemployment than college graduates. Is this part of the weak reaction? I don’t know. People who have been reporting only in the last 15 years haven’t seen this kind of disconnect. Are there other ways to quantify this you can think of? But we can see that the lowering tide is not sinking all boats in the same way. -- Mike Konczal is a fellow at the Roosevelt Institute. He blogs about finance, economics and other topics at Rortybomb and New Deal 2.0, and you can follow him on twitter. Growing inequality explains a lot of the rise of deficit hawkery and deficit peacockery, since it is a way to try to control social spending at a time when taxes on the upper class are going to have to rise. Is there a graph on the (presumably) rising income levels of legislators (including their wives)? The big question is "Are there other ways to quantify this". While it's true "that a deep and wide gulf has grown between the economic hardships of Americans and the seeming incomprehension, or indifference, of courtiers in the imperial city" it's also true that the measurement of unemployment (and of poverty, which Samuelson recently considered in his column) isn't fulfilling the need for information. At present (and for the past year), there has been an incentive to under-report employment and to pay a class of employees in cash: concerns regarding taxes and health benefits seem likely to dramatically increase the number of undereducated paid in cash. The BLS dataset includes a job dictionary which for each listed occupation provides an education profile and a geographic wage profile. These data are updated with less frequency but seem to be more "intuitively" accurate than the BLS weekly and monthly measures: the picture painted is different, revealing a relatively stable and productive yet under-educated "cash" society and a well-educated unproductive "debtor" society. i can't think of a better argument to "stay in school". This and the linked post are further proof that you can't trust either Ezra Klein or DeLong: neither of them are willing to admit the role that immigration plays in the current situation. Not only does it directly impact unemployment, but by supporting it they're supporting those who've brought us to the current situation. Washington doesn't care about unemployment, and that includes low-level hacks like Klein and DeLong. The numbers showing the comps between college grad and non-college grad unemployment make sense. The current job market forces those with college degrees to crowd out those with only high school diplomas in occupations which previously only required high school diplomas. The self employed (which counts as being employed for stat purposes) numbers also likely mask more economic pain. See R. Reich's article in the NYT (http://www.nytimes.com/2010/06/02/opinion/02reich.html). It's only natural that there will be growing economic inequality in the U.S. The 'haves' have the resources to contribute to politicians and interest groups which represent their interests and to influence policymakers in Washington. You don't hear many politicians today saying that they are looking out for the little guy. The little guy doesn't contribute much in campaign contributions. It's no surprise that there has not been much focus on federally funded job training programs as in past (and less severe) recessions. Even President Obama's 2009 proposal to provide an additional $20 billion in funding to expand community college programs which typically are more vocationally oriented than traditional four year colleges and universities was sliced and diced to a fraction of its original size. "Has the collapse of the union movement removed not only labor’s political muscle but its beating heart from the consciousness of the powerful?" Ridiculous. A majority of union employee now work for the government. The suckers still paying above market wages are the taxpayers. The economic challenge is staring us in the face- we need to compete on wages with the rest of the world. Not just in manufacturing, but in fields like accounting, software development, medicine, and beyond. If we want to pay people more than the global market rate and restrict the labor supply via immigration quotas, we're going to have higher unemployment. Sometimes it takes a crisis to force the issue, or we can continue to bury our heads in the deepening sands.